Throughout the oil and gas downturn, Clean Energy's recurring business model and steady natural gas adoption have driven growth, and management has cut costs, too. Can we expect the same this quarter? Refuse remains a growth driver for Clean Energy Fuels. Image source: Clean Energy Fuels. Natural gas refueling leader Clean Energy Fuels Corp. (NASDAQ:CLNE) is set to report first-quarter financial results on May 5. And as has become customary for the company, it recently issued an extensive press release detailing a number of recent deals the company has signed with customers, giving some indication that the growth story isn't over, even with oil prices still half what they were two years ago. Let's take a closer look at what to expect with Clean Energy Fuels' reports, and the two things that bear watching closely. Gallons delivered is a key metric for Clean Energy, and more important than revenue growth, simply because so much of the company's revenue is tied to fuel sales, and natural gas prices -- like gasoline and diesel -- have fallen sharply over the past year. So if you pay too much attention to the top line, you'll miss the "real" growth that's happening at Clean Energy. In 2015, Clean Energy delivered 16% more gallons of natural gas than it did the year before -- a remarkable result, considering that diesel prices fell more than half last year, meaning fewer fleet operators would have as much incentive to consider replacing diesel trucks with natural gas. That growth slowed to 8.1% in the fourth quarter, after reporting 17%, 15%, and 27% in the third, second, and first quarters of 2015. First, it's worth understanding exactly what drives Clean Energy's growth. Large vehicle fleet operators, such as public transit, along with refuse companies such as Waste Management and heavy-duty trucking fleets such as United Parcel Service, are major drivers of new natural gas vehicle adoption. And since it can take months from purchase until placement in operation, there's a good chance that at least part of the growth Clean Energy has delivered over the past year was from vehicles that were ordered when oil prices were much higher, only to be put into service after oil prices had already begun to fall. I'm not going to go out on a limb, right, and give you exactly if it's going to be double digits or not. But we have built in our budget a good volume growth. And I don't know that it will hit -- for years and years, we are in the 20% range, or down a little bit on last year -- could be a little bit challenged compared to 2015. But I think it will be in that [10%] neighborhood because our existing customers continue to take more vehicles. Image source: Clean Energy Fuels presentation. The refuse industry consumes around 2 billion gallons of fuel annually, and Clean Energy supplies most of the major refuse companies with either fuel, station support and maintenance, or a combination of both. Clean Energy also purchases landfill biogas from the refuse industry, selling it under the Redeem brand name. 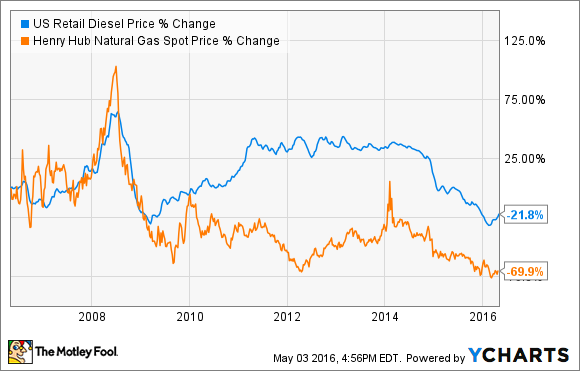 The majority of trash trucks sold every year are natural gas-fueled, and the drop in oil prices hasn't changed that. Waste Management operates more than 3,000 natural gas vehicles and is committed to converting its entire fleet to NGVs. Republic Services calls natural gas its "preferred alternative fuel technology," with 16% of its fleet running on CNG. About one-third of its new trash trucks acquired in 2015 were natural gas, as it slowly ramps up its mix of NGVs. Clean Energy has also announced expanded refueling agreements with UPS, KALM Transportation, and Raven Transportation in recent quarters. While industrywide adoption of natural gas in the trucking industry has been slow to materialize, larger operators continue to add to their already substantial natural gas fleets. And that means the company's recurring base of revenue isn't going to dry up, even if growth does slow. But back to the cadence of vehicle orders: Yes, there's a good chance that natural-gas vehicle orders have slowed over the past few quarters, and that probably means Clean Energy won't see fuel volume grow at the same pace as in the past few years. While fuel volume growth may slow this year, that's not the only thing that matters. It's just as important for investors to keep an eye on the company's financial and operational improvements. Over the past year-plus, the company has made admirable progress reducing its operating costs, both SG&A and efficiency improvements at its refueling equipment manufacturing business. There's a good chance we'll continue to see improvements in these areas, as the company works toward positive cash flows. Furthermore, the company also has more than $100 million in debt it must pay off or refinance by the end of August. The company has already made a big dent in its long-term debt so far this year, but more progress must be made in the coming quarters. Not only will doing so improve the balance sheet, but it will also reduce the $40 million per year in interest expense the company is currently saddled with. As with most recent quarters, look for steady improvement in operating costs, and steady growth in fuel volumes delivered -- if slower than in prior quarters. As long as the company continues to chip away at its debt and steadily drive down operating expenses, the gap between cash spend and operating cash flows will continue to narrow. It may be early to call Clean Energy undervalued at the current stock price because of the negative cash flows, but if the company keeps wringing out cost savings, and growth continues -- even at a slower pace -- we could look back in a few years and view the current stock price as highway robbery.